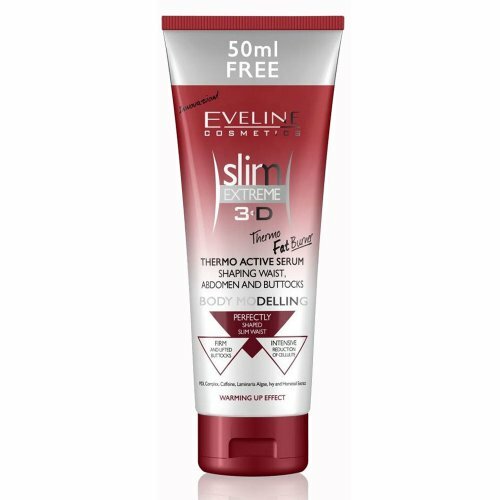 Exceptionally intensive formula of Thermo Active Shaping Serum developed in Eveline Cosmetics laboratory, thanks to the combination of highly advanced active ingredients helps to perfect the shape of woman's body. Extremely effective THERMO FAT BURNER formula delicately warms up the skin, ensuring immediate penetration of active substances deep into epidermis, maximally accelerating reduction of adipose tissue. Serum rapidly slims abdomen, improving the waist shape, modeling and firming buttocks, bringing out their slim contour. Additionally, stimulates micro-circulation in areas covered by cellulite, which significantly accelerates smoothening unevenness, improving skin elasticity and firmness. Apply once or twice per day to your waist, abdomen and buttocks. Rub gently with circular movements and wait for it to dry. Due to the special warming effect always wash your hands after the usage.